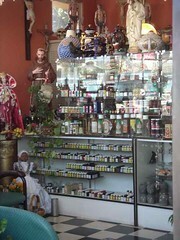 There is a Santaria store in North Park called Botanica Chango. It is basically a South American cargo cult that is based on Catholicism. I've stepped into this place a few times and have seen couples and young girls sitting in the waiting area. Presumably they are having their fortunes told or some other rite is being performed. Freaky! I tried to be polite and unobtrusive, but was obviously not welcome when I took a picture.